Iwaki uses vacuum forming to manufacture its own original trays. This method is often used in processing and forming plastic products such as egg cartons and convenience store box lunch plates. Vacuum formed products are fixtures of our everyday lives, and vacuum forming technology is essential to society. We have refined these technologies over five decades and established a solid position as a manufacturer specializing in industrial trays. We will continue to refine our technical capabilities, centering on our core vacuum forming technologies, and meet the expectations of our customers. By doing so, we will cultivate further potential for trays. We handle all of production, from consultation to delivery, through our in-house integrated production approach. Below are some comments from customers who have been impressed by the speedy proposals and high quality made possible by our approach. We had completed product manufacturing and needed trays right away. We found Iwaki, which helped us right away and enabled us to deliver our products without a problem. The speed with which they handled our order was a lifesaver. Iwaki handles everything from design to forming with its in-house integrated production system, making it easy to check quality during plant audits and allowing internal audits to be carried out smoothly. We had been using trays from another company, but had quality problems because the trays were made overseas. We found Iwaki, saw that all its products were made in Japan, and placed an order right away. The trays that arrived were high quality trays. It may seem like common sense, but we would just like to reiterate how good it is to receive high quality products. Iwaki proposed JEDEC-compliant trays, and supplied both vacuum-formed and injection-molded trays. We needed international standard-compliant trays for exporting products. We consulted with Iwaki, and they provided us with trays that we could trust, meeting physical property table, RoHS, and REACH requirements and complying with ISO standards. Iwaki was a great help to us. Iwaki offered such a wide variation of standard trays that we were at a loss (in a good way) as to which to use for the trays for our products. Iwaki staff proposed several standard trays and delivered trays to us smoothly, without any problems. Iwaki's manufacturing philosophy is one of turning our customers' wishes into reality. This focus has enabled us to do business with a tremendous number of customers. Every customer brings their own requests. Every time we receive an order, we manufacture trays with the conviction that we must always take on new technical challenges. Our original trays are used in a wide range of products, including optics, electronic components, precision devices, and vehicle components. Their main uses are packing, processing, storage, and transportation. 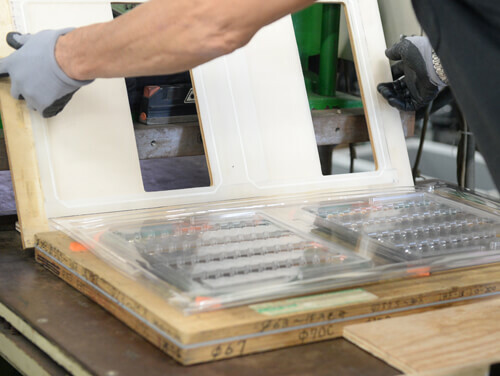 We believe it is our mission to perform original tray planning, design, mold creation, and formation faster and at lower prices than our competitors. Our whole company will work harder than ever to turn customer wishes into reality. Our customers' needs change as society changes. However, no matter how much the world may change, we will maintain the customer-centric perspective that has been part of our company since it was first founded, and continue to meet the needs of our customers. We are confident that this approach will create the foundation for the next fifty years of Iwaki's history. Vacuum forming is used to create the products we use every day, like egg cartons and convenience store box lunch plates. The high safety and low cost of vacuum forming make it a processing technology that will remain key in the years to come. Iwaki is further refining its technologies and using its ingenuity and creativity to propose new products. Vacuum forming, which suctions plastic sheets onto molds, can be used to create products of any size smaller than the initial sheet, as well as thin products. Iwaki strives to flexibly meet all customer needs, further improving customer satisfaction and ease of use. Delivering products with shorter turnaround than competitors is part of Iwaki's philosophy. Delivery times vary by product, but can be as short as three days from when a mold order is placed. In today's world, speed matters more than anything else. We have taken the lead in employing a thorough policy of speedy product delivery. We are working to achieve even shorter turnaround times. We conduct interviews with our customers about the features of their products, and propose the materials from our extensive selection that best fits customer products. Not only do we offer clear trays, but also colored trays for improving product management efficiency. Feel free to contact us about customization possibilities. When we receive an inquiry from a customer, our highly experienced staff rush to the customer site, be it in Hokkaido or Okinawa. This nimble footwork is an essential element in our building of relationships of trust. Seeing actual articles in the field enables us to propose original trays that exceed our customers' expectations. Our competitors are moving their production sites overseas, but since our foundation, we have been dedicated to our integrated production system, which handles everything from mold design onwards in our in-house plants in Japan. This enables us not only to offer low prices and fast turnaround, but has also provides customers with a priceless sense of security. We will continue to dedicate ourselves to manufacturing through our own Japanese plants. Iwaki's original trays leverage the benefits of vacuum forming to their fullest. They have established a solid track record of superb quality and functionality. If you haven't tried one of our products, pick up one of our trays and give it a look. We are sure it will pique your interest. Please feel free to consult with us regarding order schedules and estimates. You will be surprised by the competitive pricing we can offer thanks to our in-house integrated production style, which covers the entire tray production process, from molds onwards. If you have any needs or challenges related to trays, we are waiting to hear from you.